Melbourne, home to the internationally recognised grand master of cricket grounds, the mighty Melbourne Cricket Ground (MCG) known locally as the 'G''. Cricket Australia is the custodian of the game in Australia. It is made up of six member associations: Cricket New South Wales; Queensland Cricket; South Australian Cricket Association; Tasm .. Excellent coverage of cricket world-wide. Early in 2003 cricket's two major websites merged, to form one mega-site. Cricinfo.com is now part of the Wisden group and incorporates Wisden Online. Cric ..
ESPNcricinfo is the world's leading cricket website and among the top five single-sport websites in the world. Founded in 1993, ESPNcricinfo's content includes news, live ball-by-ball coverage of ..
Cricket Victoria is the governing body for the sport of cricket in the Australian state of Victoria. It administers the cricket clubs and registered cricketers in Victoria, and also oversees childr .. The 2020 World Twenty20 will begin on February 21, 2020, with the final to be held at the MCG on March 8, 2020. Eight cities throughout Australia to host ICC World T20 2020 MCG to host both wome ..
International Cricketers Registry commenced in April 1997. Since the concept of providing a vital link of information between club and player, the business has been family owned and operated with a hi ..
L&H provides cricket products that are unsurpassable in quality, and where we achieve our dream of making you unsurpassable in skill. LH Sports offers Test Cricket quality Bat's, Pad's, Gloves, Bag .. Founded in 1838 the Melbourne Cricket Club (MCC) is regarded as the oldest sporting club in Australia and arguably the biggest sporting club in the world. The club's principal public role, however, .. The Melbourne Renegades represent modern Melbourne - vibrant, diverse and progressive in the Big Bash League. We have a healthy streak of anti-establishment and we play out of a non-traditional cr ..
Melbourne's favourite Big Bash League team. We represent a city that lives and breathes sport and play at the greatest cricket stadium in the world, the mighty Melbourne Cricket Ground (MCG). T ..
70 teams play every Saturday from May to August on synthetic pitched ovals throughout Melbourne. 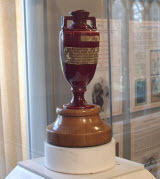 One day games of 35 overs per innings, all umpired, open aged competition, consisting of registered ..
Today, The Ashes is a series of cricket games between England and Australia played every two years* in England and Australia. The Ashes is crickets greatest rivalry, and regarded as the pinacle of .. Discover surprising connections between some of Victoria's greatest stories Free exhibition State Library Victoria | Victoria Gallery The iconic Ashes urn is coming home to Australia for only ..
VicSpirit is the Victorian team competing in the Women's National Cricket League and Women's Twenty20. Since 1930, Australian domestic women's cricket teams have contested 66 titles. Of these Victo .. The Victorian Cricket Team was formed over lunch at the Vienna Cafe more than one hundred years ago. Today, a plaque marks the site and celebrates the Victorian Cricket Team's birth in Collins Str .. The Victorian Womens Cricket Association Club Competition is divided into the following competitions: - Premier Cricket - Premier Firsts - Premier Seconds VWCA One Day Competitions - One Da ..